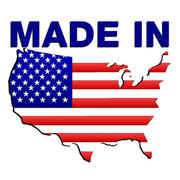 To order, click on the "Add to Cart" button relative to your bracelet size and enter our secure PayPal shopping cart. If you wish to order by mail, there are instructions at the bottom of this page. The size of the bracelet is measured in circumference inches, starting at 6 1/2 inches and going up to 8 1/2 inches. To measure your bracelet size, put a string around your wrist. Leave it loose enough to slip one finger under the string, then measure the length of the string. This measurement will be the size of your bracelet. 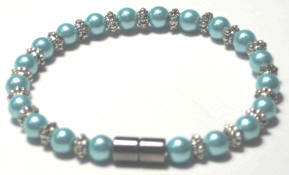 Another popular design using 6 MM round beads separated by silver beads. We have a matching necklace. Unique bright purple 6 mm round beads with pewter spacer beads on 80 lb monofilament with gun metal gray magnetic clasp. Beautiful red twisted beads with 6 MM round beads. Every bead is magnetic with 800 gauss rating. The clasp is 7 MM gun metal gray magnetic neodymium, the strongest rare earth material on Earth. 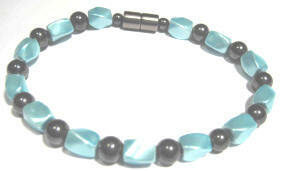 Beautiful blue twisted beads with 6 MM round beads. Every bead is magnetic with 800 gauss rating. The clasp is 7 MM gun metal gray magnetic Neodyminium, the strongest rare earth material on Earth. Beautiful Green twisted beads with 6 MM round beads. Every bead is magnetic with 800 gauss rating. The clasp is 7 MM gun metal gray magnetic Neodyminium, the strongest rare earth material on Earth. 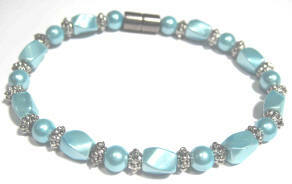 Beautiful Blue twisted beads with Blue 6 MM round beads separated by silver beads. 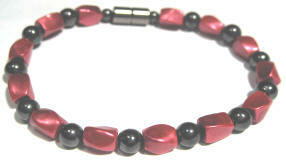 The beads are magnetic with an 800 gauss rating. The 3000 gauss clasp is 7 MM gun metal gray made from magnetic Neodyminium, the strongest rare earth material on Earth. Include the cost of the bracelet and the $7.00 shipping & Handling. 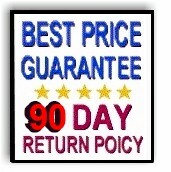 California residents add 8.00% sales tax or call and provide resale license. Magnetic Jewelry s a division of the OPB Entertainment Partnership.